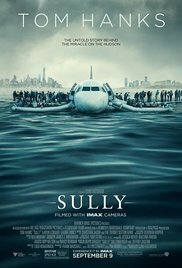 Tom Hanks takes the role of Chesley 'Sully' Sullenberger in this breathtaking miracle on the Hudson. As said in the movie it was the one good thing involving planes in New York City. Hearing that in the movie and during the weekend of 9/11 it was rather touching in a way and Clint Eastwood as the director of this flick made it just that much better. If you recall American Sniper and the storyline and visuals and everything else involved in that movie that made it great, Clint made "Sully" just as good in directing this one. They are both totally different movies, don't get me wrong, but this was really touching as we see Captain Sully save lives when both engines go out on his plane. We see him become a hero and the struggles he goes through when those that are doubting him and his choice of doing what he did weigh him down.